WASHINGTON, D.C. -- In an election in which President Barack Obama's mediocre approval ratings have cast a shadow on Democrats' efforts to maintain their slim Senate majority, his image has remained generally weak in six states featuring competitive races. This includes sub-40% approval ratings over the last several months in Iowa (38%), Kansas (33%) and Arkansas (29%). In two other states, North Carolina (42%) and Georgia (41%), Obama's approval ratings have been about equal to his national average. Among these six states, only in Colorado has Obama's approval rating (46%) been higher than his national rating. Obama's enervated approval rating has undoubtedly benefited Republican candidates across the country, particularly in terms of motivating turnout, but in a few key states, Democrats' association with the unpopular president has the potential to be particularly troublesome. In Iowa and Arkansas, where fewer than two in five residents approve of the president, Republicans have strong possibilities of taking Senate seats from Democrats. In Kansas, another state with a sub-40% Obama approval rating, one reason the Republican incumbent is having a hard time profiting from the anti-Obama environment is because there is no Democrat in the race, rather an independent challenger whose ultimate partisan allegiance is unclear. But even in states where Obama's approval rating is higher -- like in North Carolina and Georgia, where it matches the national average, or in Colorado, where Obama scores slightly better than the national average -- Democratic candidates are still fighting an uphill battle. The Senate races in these six states are among the closest in the country. Democrats currently hold four of the seats up for election in these states, while Republicans cling to two. Every race is distinct, but all will take place with a relatively unpopular second-term president as a backdrop. Party identification among adults in these six states has been generally stable in recent months, with one important exception: Arkansas residents now decidedly tilt Republican after being balanced between the two parties in the first half of the year. Over the last four months, 47% of Arkansas residents have identified as Republican or have said they are independents with Republican leanings, compared with 31% identifying as or leaning Democratic. This shift in political attitudes seems to augur good things for the GOP Tuesday in the Natural State. In Iowa, Republicans have held a nominal lead in party affiliation (43%) compared with 40% leaning or identifying Democratic. Republican Senate candidate Joni Ernst now enjoys a small but durable lead in state polls. In Kansas, Republicans have continued to show an advantage in party affiliation. However, simple party allegiances may not be as informative given the unique dynamics of the race, which features an independent who has not specified which party he would caucus with if elected to the Senate facing a long-serving Republican senator. The key in that race may be whether party leanings or frustration with incumbents is the bigger factor in voters' decisions. In North Carolina, party identification has been essentially tied, while Democrats have maintained a small lead in Colorado and Georgia. North Carolina has the dubious distinction of being the country's most expensive Senate race, with total spending projected to surpass $100 million. This bullion appears to have been spent in vain -- party preferences for July through October mirror those observed in the first six months of the year. 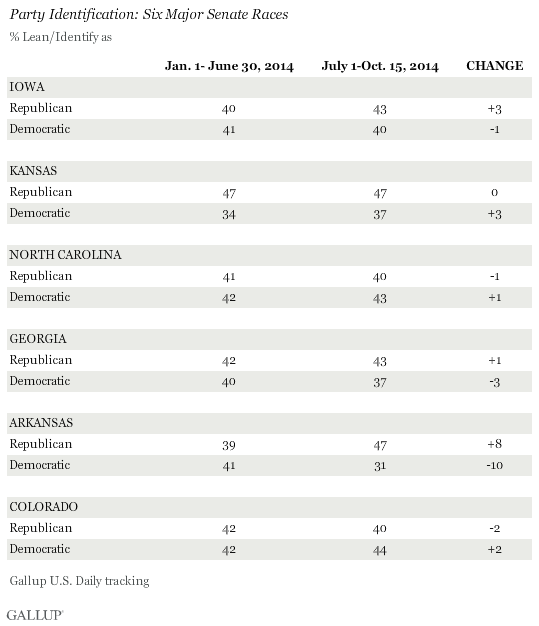 Obama is not doing the Democratic candidates in these six states any favors with his sub-par approval ratings. Only in one state is the president's approval rating above his national figure, or anywhere close to approaching the majority level. Party preferences, meanwhile, are generally stable compared with the first half of the year, despite the onslaught of political advertising occurring in these states. The one exception is Arkansas, which has seen a breathtaking rise in Republican identification compared with earlier this year when political identification was more evenly divided. Though each of these Senate races has its own character, they do not occur in a vacuum. Obama's lackluster approval rating will probably be a deterrent in motivating less-attached Democratic adults to vote, while in turn providing a turnout motivator for Republicans who are eager to deliver a blow to the president by making him deal with a unified Republican Congress in his last two years. Also worth noting is that of these six states, only North Carolina is not also conducting a gubernatorial race this year, a race that can have an additional effect on turnout. In two states, Arkansas and Iowa, Republican gubernatorial candidates appear to have the upper hand as voters head to the ballot box, which could have positive ripple effects on other Republican candidates elsewhere on the ticket. In the other three states, the gubernatorial contests, just as with the Senate matches, are currently neck and neck, a sign that truculent political division is hardly confined to the Senate elections. Results for this Gallup poll are based on telephone interviews conducted July 1-Oct. 15, 2014, on the Gallup U.S. Daily survey, with a random sample of adults, aged 18 and older, living in Arkansas, Colorado, Georgia, Iowa, Kansas and North Carolina. Sample sizes and margins of error for each state sample are listed below. Landline and cellular telephone numbers are selected using random-digit-dial methods. State samples are weighted to be representative of the state's adult population by gender, age, race, Hispanic ethnicity, and education based on the most recent Current Population Survey. All reported margins of sampling error include the computed design effects for weighting. Gallup's unique daily interviewing, involving more than 350,000 completed interviews a year, along with Gallup's 2013 50-state poll consisting of approximately 600 interviews in each state in the nation, provide the unique ability to measure the views of the residents of each state in the union on a wide variety of important measures. 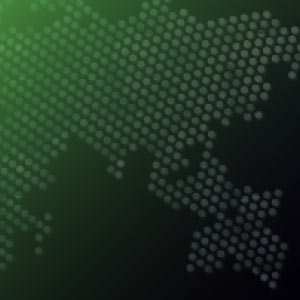 Gallup has now isolated 14 key indicators from these data sources at the state level, and has compiled them into a series of State Scorecards, one for each of the 50 states.